Luxury Villa With Private Pool offering 3 bedrooms & 3 bathrooms & Privacy. Ideal for first time visitors and for those who do not wish to drive. The Villa is located in Coral Bay and offers ideal accommodation for those who do not necessarily wish to drive whilst on holiday as the villa is located within a short walk of the center of the main strip where guests will find a wide selection of international restaurants including Chinese, Italian, Tex-Mex, and traditional Cypriot tavernas. The villa offers a peaceful location and has been designed along traditional Cypriot lines and boasts all the modern comforts for an ideal family holiday. It offers 3 bedrooms, two doubles and one twin, of which one double is on the ground floor and one double and one twin on the first floor, three full sized bathrooms, with one being on the ground floor, air conditioning throughout, including the lounge and dining areas, high speed wi fi and modern furniture. Outside, the villa presents beautifully maintained private grounds, a walk-in 4m X 10m private swimming pool, a shaded outdoor barbecue and dining area, and a full collection of sunbeds and umbrellas for up to six persons. 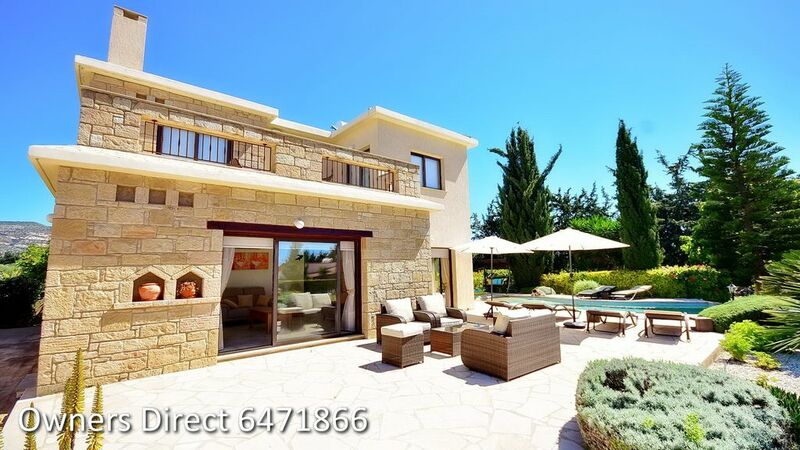 The villa will appeal to visitors who are looking for a luxury villa with privacy and and pool located within a short walk of the center of Coral Bay. Traditional Cypriot exterior design with a modern interior theme. toilet, combination tub/shower, Located on th ground floor. toilet, combination tub/shower, shower, Located on the first floor. toilet, shower, Located on the first floor. The villa is air conditioned throughout except the bathrooms. Central heating is available for the winter months at an extra cost. Secure gated parking within the villa grounds. Bath and face towels are provided but please bring your own beach towels. Modern living area which is air conditioned. A welcome pack is provided for our guests. Modern fully fitted kitchen with all the expected utensils. dining area connected to the kitchen and the lounge area which is air conditioned. Extensive landscaped gardens surround the villa offering an ideal scenic environment for relaxation and sunbathing. Private walk-in infinity 4m X 10m swimming pool. Nice Villa but certainly not "Luxury". Outside furniture in poor state of repair, leaking pipe in master bathroom(fixed by plumber), blind in dining room could not be opened due to cord being broken, under beds had not been cleaned & were covered in dust. On first entering property there was an infestation of Ants in Sitting/Dining Room & kitchen. Had to do a trip to shops to get ant repellent. It was my opinion that the Villa was not being properly checked over by the property managers prior to guests arriving. Having stayed in many Villas in the area over the years I must say this is the most disappointing Villa I have stayed at. The Villa itself is in a good location & if given some upgrading and proper checks would be a good Villa to rent but at the moment you can get far superior villas in the area for a similar cost. Stayed from 4th to 15th April 2018. Villa exactly as described. Excellent fittings and furnishings with top of the range equipment. Settled in immediately with everything needed to hand in the well equipped kitchen. Would suit family with children as small bedroom had a very small shower room and no dressing table or drawers. Garden area is beautiful and well kept. We used the quality bbq every day and the outside furniture suits all weather. Had a few naps on the swing seat too! The villa is in a quiet and residential area. It is an easy walk to bar and supermarket but we found a car very useful to explore the local coastline and sea front tavernas. Please note that the rental rates are inclusive of the use of air conditioning is available throughout the villa and high speed wi fi.